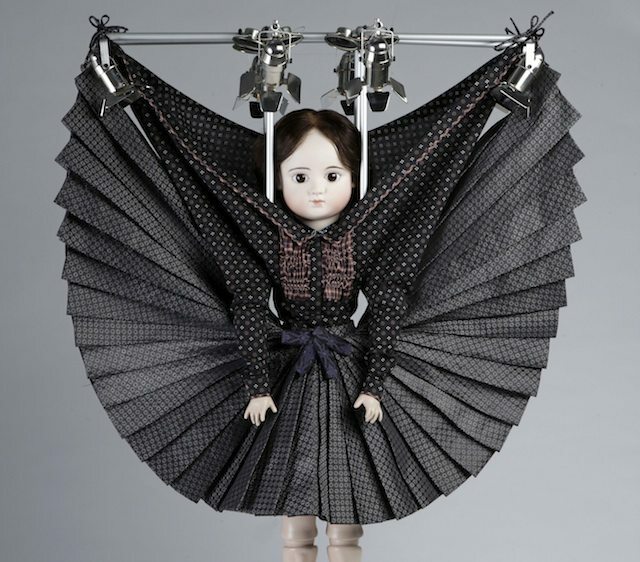 Dolls by Viktor&Rolf will be on display at the ROM as part of Luminato 2013. Photo by Peter Stigter. 2012 was Jorn Weisbrodt’s coming out as a major player in Canada’s artistic community. It was his inaugural year as the artistic director of Luminato, the annual “festival of ideas and creativity.” He was the face of the event, but most of the programming decisions had been made well before he took over. The 2013 edition, as Luminato CEO Janice Price pointed out at today’s lineup announcement at the Sony Centre, is the first festival created 100 per cent under Weisbrodt’s supervision. As far as changes go, first off, plain old “Luminato” is now “Luminato Festival.” The signature blue background on the publicity materials has been swapped out for a palette of pastel rectangles. Weisbrodt called the new colours “childlike,” which he says represents the way good art should make one feel—like a child experiencing a new sight, thought, or feeling for the first time. Whereas he compared last year’s festival to a storm crash-landing in downtown Toronto, the 2013 festival, which runs from June 14 to June 23, is more like a playground, with its heavier elements offset by more lighthearted projects. Some of this year’s programming had already been announced, like The Life and Death of Marina Abramovic, a biographical theatrical production directed by Bob Wilson (who is returning to Luminato after presenting Einstein on the Beach last year) starring Willem Dafoe and Abramovic, the renowned performance artist, herself. Also previously announced were the Atom Egoyan–directed Chinese opera Feng Yi Ting, Mark Morris’s acclaimed dance show L’Allegro, il Penseroso ed il Moderato, and Joni: A Portrait in Song, a tribute concert in honour of Joni Mitchell’s 70th birthday, featuring Glen Hansard, Rufus Wainwright, and Chaka Khan. But today we heard more details about other elements of this year’s Luminato Festival. For one thing, Luminato has a new partner in the New York Times, which will pair several of its journalists, like John Rockwell and Jon Pareles, with artists, like Atom Egoyan and Bob Wilson, for on-stage interviews. Also, the festival’s usual literary schedule is being revamped into a Literary Picnic in Trinity Bellwoods Park—a “book reading meets music festival” kind of thing. Toronto book lovers and aspiring writers can arrive with a blanket and food (or get something from the food trucks nearby) and a basket of used books, and can even sign up for one-on-one talks with several authors. Some writers attending will be Stacey May Fowles, Camilla Gibb, Daniel Karasik, Heather Birrell, Vincent Lam, Sheila Heti, Jessica Westhead, Lisa Moore, and Michael Winter. Weather permitting, this could be the highlight of the whole festival. Another unexpected twist coming in 2013 is the food program. Luminato is transforming its 1000 Tastes of Toronto (arguably the 2012 festival’s most popular event) into Future Tastes of Toronto: At the Kids’ Table. Instead of Toronto restaurants showcasing their own food, 25 chefs will partner with students from grades four to six to create dishes they will sell for $5 each during the festival’s opening weekend. Likewise, more “play” is coming to Luminato’s visual programming, including Dolls by Viktor&Rolf, at the Royal Ontario Museum, which will line a catwalk with porcelain dolls wearing miniature versions of outfits by designers Viktor&Rolf. Also bound to be entertaining is Stockpile, which will happen at Brookfield Place. A piece of performance art born out of Weisbrodt’s desire to lock a bunch of Canadian artists in a room together until they all agreed on an idea, the installation is described as “a life-sized rendering of the arcade-style claw machine game,” where the prizes will be objects donated by Torontonians, and the artists will act as the claw. A different kind of “play” will unfold once the sun sets and Luminato’s beefed-up after-hours programming takes over. A highlight will be legendary Canadian puppeteer Ronnie Burkett’s The Daisy Theatre. Burkett has created an ensemble of 35 marionettes for nightly performances that will consist of improvisation, music, monologues, and new short plays by Daniel MacIvor, Brad Fraser, Anusree Roy, Chris Craddock, and Amy Lee Lavoie. The show will be staged at the Berkeley Street Theatre, along with Jason Collett’s The Courtyard Revue series, which will present a nightly surprise “wedding band” to accompany a lively dance party. (This is inspired by his successful Basement Revue at the Dakota Tavern.) Also part of Luminato’s late-night programming will be Kid Koala’s Space Cadet, a concert experienced through headphones and custom scents. And look out for British-German art collective Gob Squad and their guerrilla filmmaking project, Super Night Shot. For Luminato 2013’s complete lineup, visit the festival’s website.